November 17, 2005. National Geographic, Vanderbilt University and the Guatemalan Ministry of Culture announced today that the archaeological project at Cancuen, Guatemala (map), had uncovered a mass burial containing thirty-one slain and dismembered individuals of noble rank, as well as the nearby graves of the king and queen of Cancuen. The discovery of the mass interment, dated to about AD 800, was made in May of this year by archaeologists Sylvia Alvarado and Tomas Barrientos, co-director of the Cancuen project, in a spring-fed cistern or reservoir near the main entrance to the Cancuen palace. The slain included men, women and children. 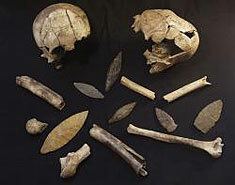 Some of the skeletons bore the marks of spear and ax wounds. The king, Kan Maax, was buried in full regalia and a necklace bearing his name and title. He was the son of Cancuén's greatest ruler, Taj Chan Ahk, who had died in 795. Perhaps the Times reporter misheard, since Cancuen king Tajal Chan Ahk was still alive in 799 according to the inscription on a monument in the museum at Coban, Guatemala (Guenter, A Reading of the Cancuén Looted Panel). It should be noted that Cancuen Ballcourt Marker 1 depicts Tajal Chan Ahk in 795 in a ceremony with a second individual named K'an Maax (see New Ballcourt Marker from Cancuen). North of the palace were the remains of at least another twelve elite individuals, some disarticulated. The archaeological project is said to have found evidence of unfinished defensive walls of stone and wooden palisades, scattered spearheads and abandoned constructions. "The king and queen and their nobles apparently were gathered together and slain en masse  many by lance thrusts to the neck or head," Demarest said. "The bones show men, women and children of all ages to have been slain." Demarest told National Public Radio that the mass killling might have been perpetrated by soldiers from other Maya city-states. In a telephone interview with the New York Times, he described it as a "peculiarity" that the assailants treated their victims with respect, taking the trouble to bury them with their finest robes and adornments, an abundance of jades, necklaces of jaguar fangs and rare shells. It would be peculiar indeed if enemy soldiers refrained from stripping the victims of their valuables. The publicity was timed to coincide with a television show, "Explorer: Last Days of the Maya," airing on the National Geographic Channel, Sunday, Nov. 27, at 8 p.m. ET/PT. Much of the story had already been disclosed months earlier to the Guatemalan press. On June 3, Prensa Libre reported that archaeologists working with the Cancuen Project had found a common grave containing the remains of at least eleven individuals who, according to early indications, were members of the royal dynasty. According to Salvador López, head of the Guatemalan Department of Prehispanic Monuments, the death of the royal family was probably due to an uprising of the people against their rulers. Archaeologists in the 1930s had also looked to a "peasants' revolt" in accounting for the destruction of Throne 1 of Piedras Negras and copious signs of burning at that site (Martin and Grube 2000; see Mesoweb Encyclopedia sub Piedras Negras Ruler 7). 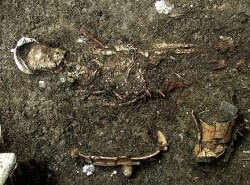 According to the Guatemalan newspaper report, a royal burial had been found a year earlier. It was believed to be that of the site's last ruler, who was thought to be the son of king Taj[al] Chan Ahk, who built the palace of Cancuen. In May of 2005, also according to the report, the remains of a queen had been found 100 meters from the pool containing the mass interment. In an accompanying interview with Prensa Libre, Arthur Demarest said that the year before, the archaeologists had found a king wearing a necklace of jaguar fangs and a headdress which extended from head to feet. The latter still showed as lines of green, red and white, suggesting quetzal plumes. On November 3 of this year, in connection with an exhibition in Finland of Maya pieces from Guatemala, Prensa Libre mentioned that the remains of a king and queen of Cancuen had been found.